Behind the headquarters buildings of the Natchez Trace Parkway, hidden from view and unannounced by signage, are the remains of the Tupelo Homesteads, one of the most radical economic experiments ever conducted in the United States. Remarkably well preserved and faithful to original design, these three-, four-, and five-room houses are the remnants of a program that sought to have American families demonstrate the way to sustain a certain economic competence in the midst of the Great Depression. Fearing continued underemployment of American wage workers, New Deal planners sought to induce industry to decentralize by moving some of its operations from overcrowded urban centers to more bucolic surroundings. M. L. Wilson and Rexford G. Tugwell proposed the creation of a new American consumer-producer. If families could satisfy most of their nutrition requirements at home, they could sustain themselves and perhaps even prosper by working only part time for wages. The Division of Subsistence Homesteads (DSH), a short-lived agency within the US Department of Interior, was created by an amendment to the National Industrial Recovery Act. DSH officials authorized funding for twenty-four “industrial” communities designed to combine subsistence agriculture with part-time wage work, on 15 December 1933. Qualified applicants received the opportunity to purchase a homestead financed by the US government. In addition to the Tupelo Homesteads, the DSH approved projects for Hattiesburg, Laurel, Meridian, Richton, and McComb. The Richton project was the only “farm community” ever completed by the DSH. The McComb project, named in honor of First Lady Eleanor Roosevelt, stopped operations after the eviction of its first homesteader. The Laurel project was never started, and the other Mississippi projects faded quickly into the general community. In Tupelo, the first residents moved into their new homes on 16 November 1934, two days before Pres. Franklin D. Roosevelt, Eleanor Roosevelt, and interior secretary Harold Ickes visited. The First Lady’s obvious fascination with the house and equipment became part of the local color, and journalists were amused at the president’s discomfiture when he had to send one of his staffers to interrupt his wife’s extended conversation with a resident, Mrs. Barron. The president’s visit to Tupelo and to the Tupelo Homesteads represented the high-water mark for the project. For various reasons, including a highly localized building boom after a tornado struck in 1936, the community did not meet the DSH’s expectations. However, Tupelo was the most successful and most interesting of the DSH’s “industrial” communities. The Tupelo Homesteads were surprisingly well equipped and situated. The community initially consisted of twenty-five houses (nine with three rooms, eight with four rooms, and eight with five rooms) on lots averaging a little over three acres each. Workers wired each house with a single-party phone line, a luxury for the day. Each house received water from a deep well equipped with an electric pump capable of delivering 225 gallons per hour; a pump house enclosed the mechanism. The DSH provided each homestead with fruit trees, berry bushes, farming equipment, fertilizer, seed, a cow, two pigs, and twenty-five chickens as well as a cow stall, chicken run, and hog pen. Each kitchen was equipped with a pressure cooker, a relatively new innovation, and supplies for home canning. However, none of the homesteaders exercised the option to buy, and the management of the project passed with bewildering rapidity among New Deal agencies, moving from the DSH in the Interior Department to the Resettlement Administration, the Farm Security Administration, and ultimately back to the Department of Interior under the National Park Service. 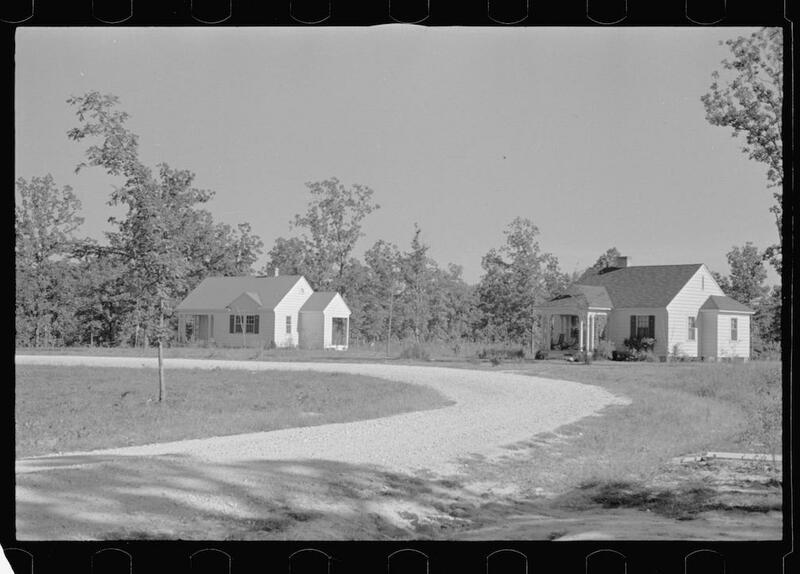 Although the Tupelo Homesteads did not achieve the objectives envisioned by the planners, it was the most successful of the one hundred or so depression-era communities built by agencies of the US government. Moreover, the remnants of many other communities have been absorbed into contemporary neighborhoods or have been extensively modified, and most of the communities have simply disappeared. The Tupelo Homesteads remained distinct because they were transferred to the Interior Department for use as the headquarters of the Natchez Trace Parkway. Today, even though the cleared fields have been overtaken by vegetation and the ordered orchards have disappeared, the houses look very much as they did in the 1930s. In the mid-1950s the Park Service made minor alterations, primarily adding or enclosing porches and installing windows. Though Tennessee’s Cumberland Homesteads do so to a lesser degree, the Tupelo Homesteads is the only New Deal community to retain its architectural, structural, and environmental integrity.